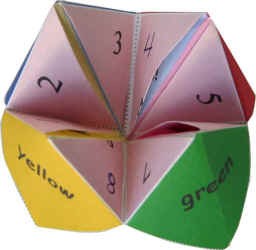 For our stupid pet trick we were inspired by the “Love-O-Meter” (and the paper fortune tellers we made in elementary school– see below) and chose to create a fortune teller using a servo motor and an FSR. We used the Servo library to find a code to work with initially, and then modified it to suit our project. The micro servo motor, without interference of the FSR, goes through its cycle ranging from 0 degrees to ~180. Once you touch the FSR, our motor will “answer your questions”. It’s answer from your touch is limited to “try again”, “no”, and “maybe”. The reason that the servo takes a bit to respond to the FSR reading is because it must finish its current cycle due to the delays in the code. We’re unsure how to code such that the servo passively switches states but is immediately interrupted when the FSR is touched. Our stupid pet trick, or lousy fortune teller machine, will only respond to your touch with negative answers. Enjoy! // Note by Sam and Anna: Edits were made to fit our specific set up.